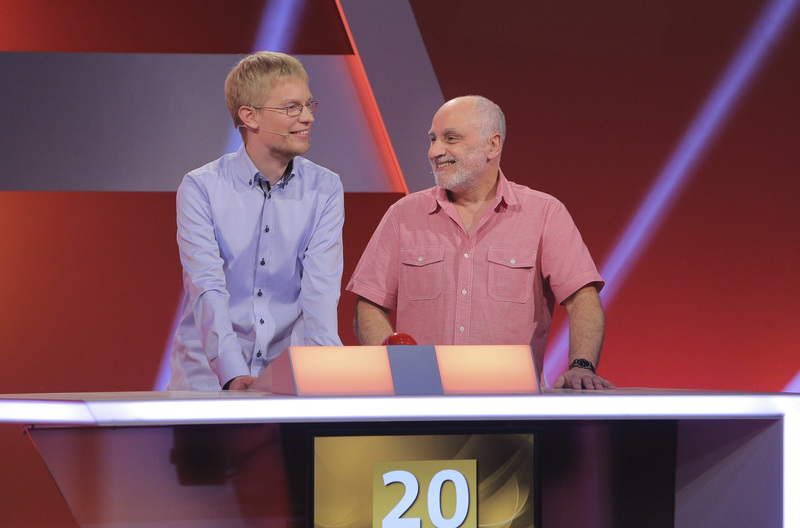 Dr. Christian Schneider and Karl Geib, both of Johannes Gutenberg University Mainz (JGU) won the SWR quiz show „Quiz Helden”. The episode was broadcast March 4th on SWR TV. In an exciting game of puzzling and trivia, the two physicists showed how their expertise can help them answer tricky questions about the region without the use of mathematical formulas. Mainz, 5th March 2018—After 45 minutes of excitement, tension, lightning-fast buzzer-pushing, and teamwork, Karl Geib and Dr. Christian Schneider left the SWR studio in Baden-Baden with a feeling of satisfaction. They had won 2,000 EUR against the competing team and become “Quiz-Helden” (Quiz Heroes). In their “real lives”, Geib and Schneider spend much of their time working together in the Institute for Physics workshop. Schneider, who is responsible for scientific communication and school projects in the PRISMA Cluster of Excellence, and his engineer colleague Geib regularly create experiments for schoolchildren and build machines for exhibition at the Mainz Science Market. It was this kind of public event that drew the attention of SWR last summer. In June 2017, the two physicists and a team of helpers and schoolchildren set a Guinness World Record™ for the longest magnetic ball accelerator. They were promptly contacted by SWR and invited to take part in the quiz show. As with their ball accelerator, small difficulties at the beginning failed to throw off the team. They stayed neck-and-neck with their opponents for the duration of the quiz. It wasn’t just physics knowledge that made Schneider and Geib successful in the end—they also relied on quick reflexes and gut feeling. In the last round against the three prominent opponents, they couldn’t let their nerves get in the way. At the end of the day, Christian Schneider and Karl Geib took 2,000 euros home with them, and their jubilation at the end of the tense game was clear to see. Christian Schneider und Karl Geib (fltr) are excited about their first points on their way to winning the show.